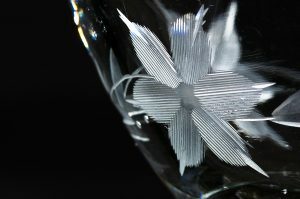 Diamond dental burs can be used for a variety of different reasons but there’s one fun creative avenue you might want to pursue and that’s glass engraving. Here are four tips to help you get started if you’re new to this crafty idea. You might find that the edges of your engraving chip from time to time. This can be prevented by using fine grade diamond burs. They come in a variety of grits and the higher the number the finer the grit. You can also help prevent it by using a different speed on your drill. When engraving, make sure that you use water. This will help lubricate what you’re working on so you’ll get smoother edges. Not only that, it will also help you preserve the life of your diamond burs, which will save you money in the long run! Start yourself off on the right foot by painting your design on the glass using white acrylic paint, watering it down a bit so the lines are thin and so you won’t get paint on your engraving tool. There are so many different techniques to try when glass engraving but a fun and easy one for beginners is stippling. Just tap the surface of the glass with your diamond bur. You’ll see that each tap creates a dot and you can then use this technique to create your picture. To help you really get going, make sure you put a backdrop in or behind what it is you’re planning to engrave. This is usually a black cloth and will really help you see what you’re doing.